Arriving Jan 29: Version 2 of the Bodhi Mind app! The Bodhi Mind app was launched just over a year ago, bringing you a library of Bodhipaksa’s guided meditations. At the moment there are over 300 meditations, covering everything from basic mindfulness of the breathing, to lovingkindness and compassion meditations, to practices for awakening insight. Now it’s time for the next step. 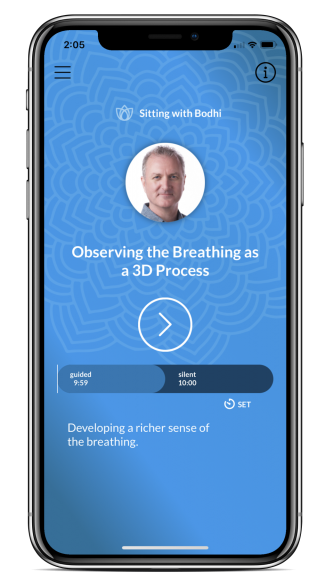 Version 2 of the app (which is for iPhone and iPad, includes a series of daily meditations to help support your practice in a deeper, more intimate way. It’s called Sitting With Bodhi, which reflects that each day you have the opportunity to sit in meditation, receiving guidance that comes from Bodhipaksa’s 36 years of practice. Each meditation starts with 10 minutes of guidance from Bodhipaksa, followed by a silent period, and concludes with a bell. The length of the silent period is up to you. Before you sit you choose how long the meditation will be in total. You can sit for just 12 minutes, or 20, or 40. It’s your choice. The app remains free to download, so you can test it our to see if it’s for you. There are options to subscribe if it is. And a certain amount of content will always be available to you even if you want to stick with the free version.